This image from the Mars Exploration Rover Opportunity's panoramic camera is an approximate true-color rendering of the exceptional rock called "Berry Bowl" in the "Eagle Crater" outcrop. 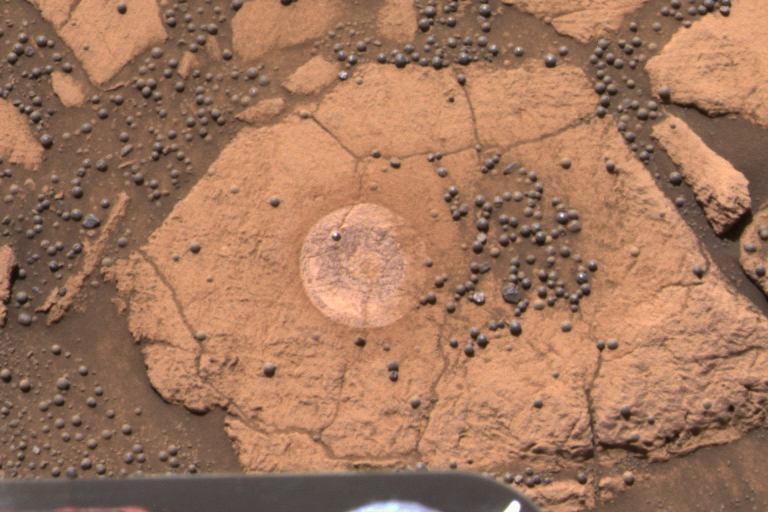 The study of this "blueberry-strewn" area and the identification of hematite as the major iron-bearing element within these sphere-like grains helped scientists confirm their hypothesis that the hematite in these martian spherules was deposited in water. To separately analyze the mineralogical content of three main features within this area -- blueberries, dust and rock -- it was important that the rock abrasion tool's brush was able to rest on a relatively berry-free spot. The rock's small size and crowd of berries made the 10-minute brushing a challenge to plan and execute. The successful brushing on the target whimsically referred to as "Near Empty" on the rover's 48th sol on Mars left a dust-free impression for subsequent examination by the rover's spectrometers. No grinding was necessary on the rock because spectral data obtained on the dust-free surface were sufficient to verify that the rock's chemical composition differs significantly from the hematite-rich berries.